This is a continuation of what seem to have become a series of DNA Snps associated with CFS and conditions typically co-morbid. If the percentage in the Healthy Controls and the IBS Patients for one particular item are far enough apart, and after doing some mathematics, the researchers will conclude that is a positive or negative association of the SNP with a patient or a symptom. For example rs174697 for G/G we have 65.6% versus 78.8% (thus having it suggests IBS is more likely), while for A/G we have 28.1% versus 18.7% suggesting IBS is less likely (1.5x less likely – sometimes called the Odds Ratio or “OR” i.e. 28.1/18.7). 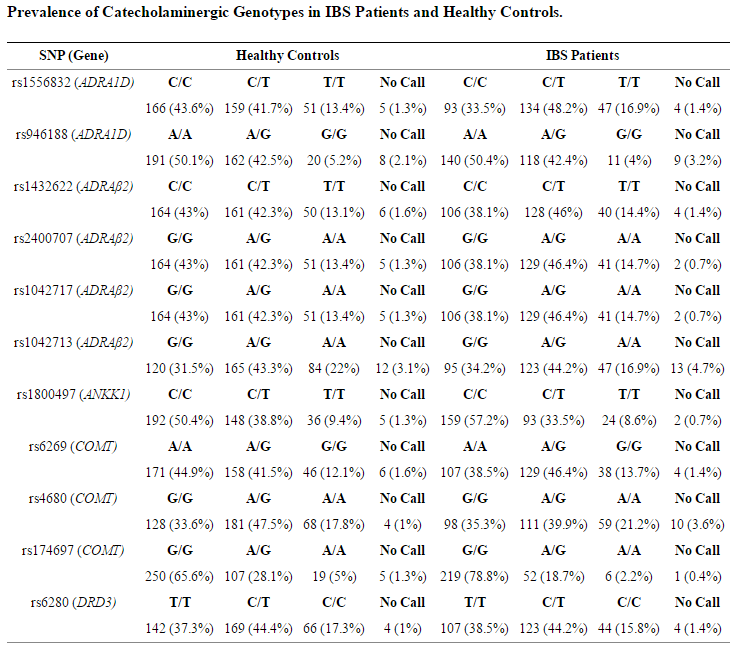 A meta-analysis of immunogenetic Case-Control Association Studies in irritable bowel syndrome . Genetic variants in CDC42 and NXPH1 as susceptibility factors for constipation and diarrhoea predominant irritable bowel syndrome . Only one SNP is available in 23AndMe, the one associated with diarrhoea. From the literature that I could find, “CC” is likely the bad one.